Proper functioning of ecosystems involves precise coordination between many individuals and/or species. Unfortunately, the majority of ecosystems are impacted by invasive species. Regardless of whether these species were introduced accidently or purposefully, invasive species often have major impacts on the way ecosystems function. One such example is the introduction of round goby into the Laurentian Great Lakes. Round goby originate from the Black and Caspian seas in eastern Europe, and were accidently introduced into the St. Clair River in the early 1990`s, likely through the ballast water of ships (Jude et al., 1992). Since then, round goby have flourished and have spread throughout the Great Lakes. Therefore, it is important to learn what impacts this invasive species has on native species and the invaded ecosystems. In particular, there is great interest in understanding if and how round goby have altered the food web within the Great Lakes. Figure 1. Round goby. Photo by ABEL, McMaster University. To assess the impacts of invasive round goby on native food webs, researchers from Queens University collected fish-eating (piscivorous) large and smallmouth bass from Eastern Lake Ontario and analyzed what they were eating (Nelson et al., 2017). To accomplish this they collected the stomach contents of 49 largemouth and 287 smallmouth bass that had died during fishing tournaments (Figure 1). They then extracted the DNA of the recently consumed prey and compared it to a DNA database of prey fish in the region, allowing them to quantify exact which species were in their stomach. The researchers were then able to identify the proportion of round goby that each bass had consumed by comparing the amount of goby DNA out of the total extracted DNA from each stomach. The team also tracked changes in body size of bass populations over a 25 year period using data collected by the Ontario Ministry of Natural Resources and Forestry (MNRF). 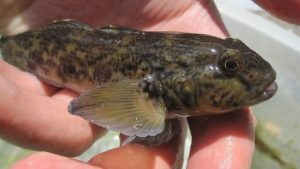 This time course allowed the researchers to determine whether body sizes of bass have changed following the round goby invasion (first observed in Lake Ontario in 1998). Figure 2. Largemouth and smallmouth bass. Round goby represented 86% of the stomach contents of smallmouth bass and 29% of largemouth bass, confirming that round goby are an important food source for piscivorous fish in Lake Ontario, and likely the other Laurentian Great lakes. The researchers suggest that the differences in the proportion of round goby found in smallmouth and largemouth bass stomachs is a result of the different habitat preferences of these bass species. 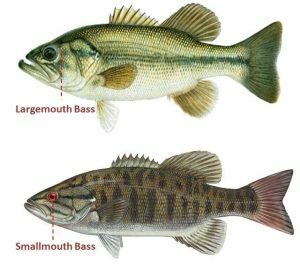 Smallmouth bass prefer rocky and sandy substrates were round goby densities are usually high, whereas largemouth bass mostly stay in weedy areas where fewer round goby are typically found. Analysis of the long term dataset collected by MNRF indicated that both large and smallmouth bass have increased in size since the appearance of round goby, likely a result of an increase in prey availability as round goby populations increased. Interestingly, this apparent shift in feeding preferences has had very little effect on slowing the invasion of round goby, which are currently found in all 5 of the Laurentian Great Lakes with estimated densities up to 100 fish per square meter in some locations (MNRF, 2012). While an increase in prey availability may appear to be a good thing, causing bass populations to increase in body size, it is important to keep in mind the negative impacts that invasive species cause. Round goby largely feed on zebra and quagga mussels (Taraborelli et al., 2010), both of which accumulate toxicants from their environment in their tissues (Roper et al., 1996). As goby eat these mussels, the toxicants originally taken up and accumulated by the mussels are transferred to the goby. When round goby are then eaten by piscivorous fish (such as bass), they pass along their contaminant loads to these predators. Invasive species can have positive (additional food source) and negative (mobilization of toxicants) impacts on ecosystems, however, alterations to ecosystems generally have long-term consequences. Therefore it is important to continue to monitor and track invasive species, such as round goby, in an effort to uncover and limit these consequences. Roper, J.M., Cherry, D.S., Simmers, J.W., and Tatem, H.E. 1996. Bioaccumulation of toxicants in the zebra mussel, Dreissena polymorpha, at the Times Beach Confined Disposal Facility, Buffalo, New York. Environmental Pollution. 94 (2): 117-129. Taraborelli, A.C., Fox, M.G., Johnson, T.B., and Schaner, T. 2010. Round goby (Neogobius melanostomus) population structure, biomass, prey consumption and mortality from predation in the Bay of Quinte, Lake Ontario. Journal of Great Lakes Research. 36 (4): 625-632. Previous story The Next World Fish Migration Day is Just Around the Bend!